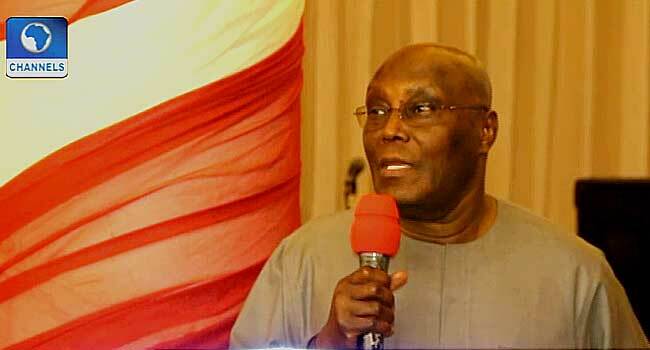 The presidential candidate of the Peoples Democratic Party (PDP), Atiku Abubakar, believes only a government that understands how to run the economy can save the country from its challenges. Atiku said this in a piece on Sunday entitled ‘My Takeaways From Budget 2019’. In the critique, the former vice president faulted the Muhammadu Buhari administration’s budget proposal for 2019. According to him, the proposal is “fundamentally flawed” and built on a “very shaky foundation”. The proposed budget as presented is fundamentally flawed. It deliberately ignores and fails to address current realities and pretends, as Mr President asserts, ‘we are on the right direction’. On the contrary, the 2019 budget is built on a very shaky foundation and makes very generous, often wild and untenable assumptions which pose significant risks to its implementation. It will be a disservice to the country if we ignore these fundamental flaws. Several inaccurate claims litter the budget document – all, I think, in an attempt for Mr President to whitewash the regime and hide their monumental failure to improve, even minimally, the welfare and living standards of much of the population. I see the rhetoric of ‘inclusive, diversified and sustainable growth’ as no more than an amplification of the APC-led government’s renewed propaganda to hoodwink the citizens into believing that there is ‘light at the end of the tunnel’. In reality, the economy is yet to recover from the 2016/2017 recession as it remains SEVERELY STRESSED, extremely fragile and vulnerable to external shocks. GDP growth declined from 2.11% in 2017 to 1.9% in Q1 and to 1.5% in Q2 of 2018. In Q3 of 2018, there was only a marginal increase of 0.3% to 1.8%. In its current form, the local economy is not dynamic enough to journey to their so-called NEXT LEVEL. For the year 2019, a general slowdown in the real growth rates of economic activity in both the oil and non-oil sectors has been projected at 1.9% by the World Bank. This rate is well below the 2019 budget projection of 3.01% and is not enough to create the needed jobs for the growing population of the country or for the attainment of the SDGs. So, contrary to Mr President’s assertion, capital importation actually shrinks! In reality, Mr President should expect no less. It is a fact that under his watch and resulting from his actions or inactions, investor confidence in the economy has waned like never before in Nigeria’s history. Nigeria remains an uncompetitive economy as demonstrated by the recent World Economic Forum (WEF), Global Competitiveness Index which positions Nigeria as 115th of 140 Countries. The Report shows that Nigeria has moved three places down, contrary to Mr President’s claim that ‘we are moving in the right direction’. Nigeria remains one of the most difficult places to do business as evidenced by the massive outflows of capital in recent times. Even Mr President’s acclaimed successes in agriculture can be interrogated. In spite of the so-called ‘increased investment across the entire value chain from agricultural inputs to farming and ultimately, food processing’, agricultural growth is well below historical levels. The growth in agricultural production declined from 3.48% in Q3 2015 to 1.91% in Q3 2018. Similarly, in 2018, growth has been declining from 3% in Q1, to 1.19% in Q2 and 1.91% in Q3. There is little evidence to show that ‘increased investment’ in agriculture has yielded positive results. First, the 2019 (budget) is built on a very shaky foundation. It seeks to consolidate on the ‘achievements’ and ‘successes’ of the 2018 budget. However, the 2018 budget was itself poorly implemented. Actual revenue collected was only N2.84 trillion (as at September 2018) against projected revenue of N7.17 trillion. This implied that as at September 2018, only approximately 40% of projected revenues were realized by the Federal Government. Similarly, by December 14, 2018, only N820.57 billion was released for capital spending out of a projected expenditure of N2.652 trillion. This implied that only 31% of the capital budget was implemented. This would impact negatively on growth, jobs and poverty. Secondly, the 2019 budget is business as usual budget. The Federal Government keeps repeating the same mistakes BUT expects different results. For example, although the current resource position remains precarious, government does not intend to introduce significant fiscal restructuring. Thus, in spite of dwindling revenues, subsidy on PMS will continue (US$1 billion is budgeted for that); Government does not intend to introduce any reforms in the foreign exchange market as multiple exchange rates will be maintained – thus given away between ₦300 billion and ₦800 billion to opportunists, rent-seekers, middlemen, arbitrageurs, and fraudsters; and finally, the budget is overwhelmingly recurrent, with capital spending taking the back seat. Thirdly, 2019 Budget is based on grossly exaggerated assumptions. They are NOT able to put in place any coherent and comprehensive policies to give hope that these assumptions can be met. For example, the Oil price benchmark has been pegged at $60 per barrel and domestic oil production will be maintained at 2.3 million barrels per day. Of recent, the oil market has been turbulent, and Brent Crude sells at less than US$60. There are projections of over-supply resulting from US shale production and pressure on Saudi by the US not to cut production. With regards to local production, we all know that throughout 2018, average production was 1.95 million barrels per day. Indeed, the latest report from OPEC suggests that Nigeria will be required to cut production to 1.65 million barrels per day. This implies that revenue targets to implement the budget will not be met. The most laughable assumption is that real GDP will grow at 3.01 per cent. When indeed, GDP growth has been sluggish, with a projection of 1.9% in 2019. The government cannot cut spending and expect the economy to grow. Fourthly and very fundamentally, 2019 Budget is very small. The size of the budget is not sufficient to stimulate the growth of the economy, create jobs and alleviate poverty. The planned total expenditure of N8.83 trillion is lower than 2018 budget by approximately N290 billion. The Federal Government is contracting the economy whereas, in a period of recession, governments MUST spend more to have a meaningful impact on jobs and poverty. Fifthly, Nigeria’s fiscal crisis persists and fiscal position of the Federal Government, and by extension, the states and local governments remain precarious. First, projected revenues of N6.97 trillion are 3% lower than 2018 and second, the oil sector continues its dominance as it contributes 54% of the budget revenues. The non-oil sector is expected to contribute only 20% of the budget revenues. There are no coherent and comprehensive plans to expand the resource horizon of the Federal Government. As a result of the brewing fiscal crisis, the budget deficit remains high at N1.86 trillion. This is equivalent to 21% of the budget and 1.3% of GDP. The implication is that the Federal Government will need to borrow more in 2018 to implement the budget. Debt Service is already putting a strain on government revenues. The sum of N2.14 trillion has been provided for debt service. This means that 30% of projected revenue will be used in debt service. It is, therefore, putting it mildly to say that the 2019 proposed budget is not developmental, will not pull Nigeria from the abyss and may, indeed accentuate the misery and hopelessness the Nigerian people have lived with since 2015. Resolving these thorny issues requires a significant departure from the APC-led government’s ways of doing things. #TheAtikuPlan will accelerate growth rather than contract the economy to steer Nigeria out of recession and to create opportunities for our youth to be self-employed. The private sector will be a critical driver of economic growth and #TheAtikuPlan will, therefore, act expeditiously to create a supportive and enabling environment for businesses to invest and thrive. We shall disrupt and improve the budgeting process to facilitate more effective budget impact on the economy by increasing, significantly, the share of capital expenditure in the budget to a minimum of 40% in the first instance. To facilitate increased capital spending, we shall improve spending efficiency by cutting on recurrent expenses, by ensuring the judicious utilization of all borrowed funds for economic diversification and infrastructural development and by promoting more Public-Private Partnerships in critical infrastructure funding. #TheAtikuPlan recognises that Nigeria’s current unprecedented fiscal crises, characterized by rising debt levels and revenue shortfalls, have resulted largely from APC-led government’s poor management of resources. We shall, therefore, undertake significant fiscal re-structuring including a review of the current subsidy regime and of the monumental losses to the economy arising from leakages from the operation of the foreign exchange market, in order to channel resources into the critical sectors of the economy.